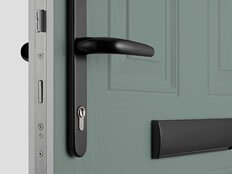 Every single composite door we install boast state of the art security features like anti pick and snap lock barrels and a multi point hook locking system making this one of the most secure doors in its class. 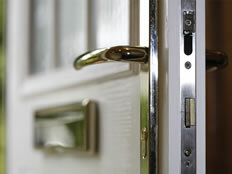 We install a stunning range of colour composite doors in Dudley. Providing a tailored service from start to finish from initially measuring up and giving you a quote to discussing the options available right through to installing your new door. Our service is fast and friendly and because we have been installing composite doors for many years your guaranteed a high level of finish. Call today or invite us round to measure up and give you a no obligation quote. We offer a huge range of decorative glazing options which offer some of the latest colours and bevels to cutomise your front door exactly how you want. View our Decra Lead brochure download below for all the options you can choose from. Choose from White, Black, Chrome or Gold.